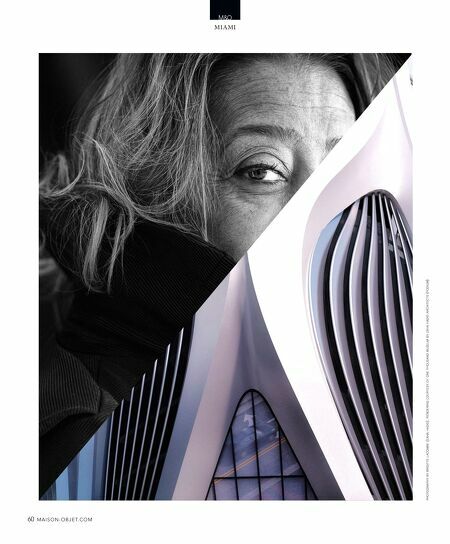 m a i s o n - o b j e t. c o m 61 Sensuous Sculpture: One Thousand Museum, Zaha Hadid's first residential project in the Western Hemisphere, resembles a massive yet delicate objet d'art. Located on Biscayne Boulevard, the 62-story tower, which will be completed posthumously, is designed to deemphasize the unique private terraces and create a sleek, dynamic sculptural effect from the base to the crown. Mi aMi's exuber ant sk yline continues to r ise, courtesy of the world's a-list architects. by robyn a. friedman Style & Starchitecture If you haven't been to MIaMI recently, you May be In for a surprIse. No longer a sleepy Southern town with a touch of Art Deco, Miami has emerged as a modern international city and financial hub. A nd a wave of new const ruct ion, bot h resident ia l a nd commercia l—as ev idenced by t he sea of cra nes v isible across its steel, concrete, and glass skyline—is transforming the city even further. Much of that new con- struction is the work of the world's top architects, who are putting their permanent mark on Miami. Unlike European cities, built centuries ago, Miami has been something of a blank canvas for architects, designers, and city planners, giving them the opportunity to create a new—and highly designed—urban center. "Architects are dreamers, and what we dream is that our ideas become reality," says Bernardo Fort-Brescia, a founding principal of the Miami-based firm Arquitectonica, which has designed more than 100 buildings here, infusing the city with a bold modernism. "Miami is an amazing sort of fantasyland for architects because there are developers willing to make those ideas reality." Fort-Brescia, who has designed structures all over the globe, says he has never seen a metropolis transform itself so quickly—in Miami's case, 25 to 30 years. But the world's elite architects are coming to Miami for practical reasons as well: They've been recruited by developers to lend their star power to local ventures. "We are fortunate to have a new breed of visionar y developers who are doing a great service to the city by enlisting these architects to design their projects," says Rodolphe el-K houry, dean of the University of Miami School of Architecture. 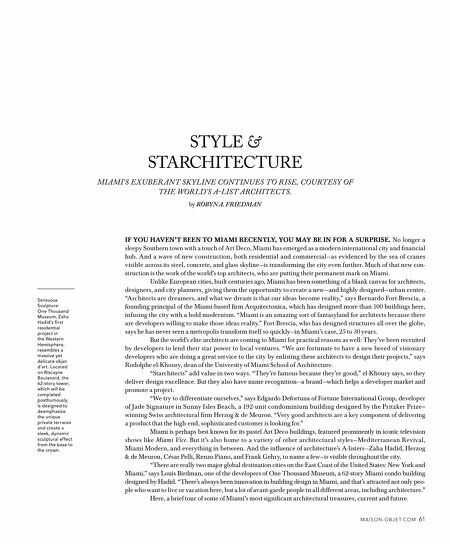 "Starchitects" add value in two ways. "They're famous because they're good," el-K houry says, so they deliver design excellence. But they also have name recognition—a brand—which helps a developer market and promote a project. "We try to differentiate ourselves," says Edgardo Defortuna of Fortune International Group, developer of Jade Sig nat u re i n Su n ny Isles Beach, a 192 -u n it condom i n iu m bu i ld i ng desig ned by t he P r it z ker P r i ze – winning Swiss architectural firm Herzog & de Meuron. "Very good architects are a key component of delivering a product that the high-end, sophisticated customer is looking for." Miami is perhaps best known for its pastel Art Deco buildings, featured prominently in iconic television shows like Miami Vice. But it's a lso home to a va r iet y of ot her a rchitectura l st yles—Mediter ra nea n Rev iva l, Miami Modern, and everything in between. And the influence of architecture's A-listers—Zaha Hadid, Herzog & de Meuron, César Pelli, Renzo Piano, and Frank Gehry, to name a few—is visible throughout the city. "There are really two major global destination cities on the East Coast of the United States: New York and Miami," says Louis Birdman, one of the developers of One Thousand Museum, a 62-story Miami condo building designed by Hadid. "There's always been innovation in building design in Miami, and that's attracted not only peo- ple who want to live or vacation here, but a lot of avant-garde people in all different areas, including architecture." Here, a brief tour of some of Miami's most significant architectural treasures, current and future.